On Monday I spent several hours researching the places Jack Kerouac visited in Rocky Mount. I am not the first to do this work: John Dorfner of Raleigh, N.C., has done the heavy lifting. My goal is to assemble facets of Kerouac in new ways, while adding new information. Testament being Rocky Mount, the house is on Tarboro Street. That’s the neighborhood where so many of my friends lived, when I grew up in Edgecombe County. 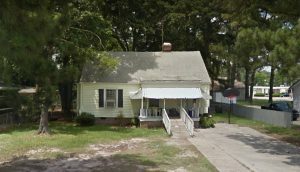 It was 1328 Tarboro Street, just across from the little store where Dad and I used to watch Matchbox car races, about a half mile from Eastern Elementary School, where I attended third and fourth grade. Sycamore Street, Eastern Avenue, and I went to junior high school at Edwards, on Marigold Street. Changes after desegregation meant that many people left these beautiful neighborhoods – and Edgecombe County became somehow less desirable, in what is called “white flight” – two decades later I returned to my own elementary school to teach French. I loved the children, although the demographics were against them. Their families had few resources; often when I visited their homes I saw roaches, horror movies on play, even in one home a pile of dirt. Parents who drank; and crack that invaded our cities in those days. We segregate ourselves based on money, skin color, fame. We classify ourselves as “better than,” even when we don’t intend to. Kerouac knew that. Indeed, On the Road contains the narrative of a man whose first language was French, who never felt he belonged to this or that group; a man who by traveling was able to connect with all people, all places. The Buddha taught that all life is change. A river is never the same from moment to moment – and yet, it is always the river. On the road, everything always changes, and yet it is always the road. It’s been almost a decade since I contributed to this blog. That happened for a number of reasons, primarily my divorce and the precarious situation I found myself in, at times, taking care of myself, my house, 6 to 8 animals at the time, and running marathons. I can’t say I’ve perfectly found my footing, but without question my life has exploded in all the best ways. I completed an advanced policy degree, the Master of Public Administration at East Carolina University; I have work that I love; and a home full of animals who give my life structure and fill it with joy. But that’s not what this post is about. This post is about heading to Rocky Mount on a familiar pilgrimage to the house where Jack Kerouac lived and wrote during the years 1955-56. He finished On the Road in 1951, but it wasn’t published until 1957. He did most of his living and writing in those in-between years. Kerouac in Rocky Mount, N.C.
There’s still one detail regarding Jack Kerouac’s time in Rocky Mount to settle … and that’s the fate of the house on West Mount Drive where he lived in the mid-1950s with his sister, Nin. It’s referred to as “Big Easonburg Woods” in his work, as that was how the crossroads was known then. Thanks to John J Dorfner, who lives in Raleigh, N.C., we know the whereabouts of the house. I’ve been speaking with him and we’re trying to now figure out what the future holds for this house. He and I, and perhaps other Kerouac fans out there, would like to see this little farmhouse preserved and protected. There’s a risk, however, that it will change hands before that can be done. In the development frenzy that sweeps like Sherman through eastern North Carolina, who knows how long a Depression-era farmhouse could hold out? Meanwhile, in the next few days I’ll make some updates to the pages on this site about Jack Kerouac.